The Craig City Council meets. 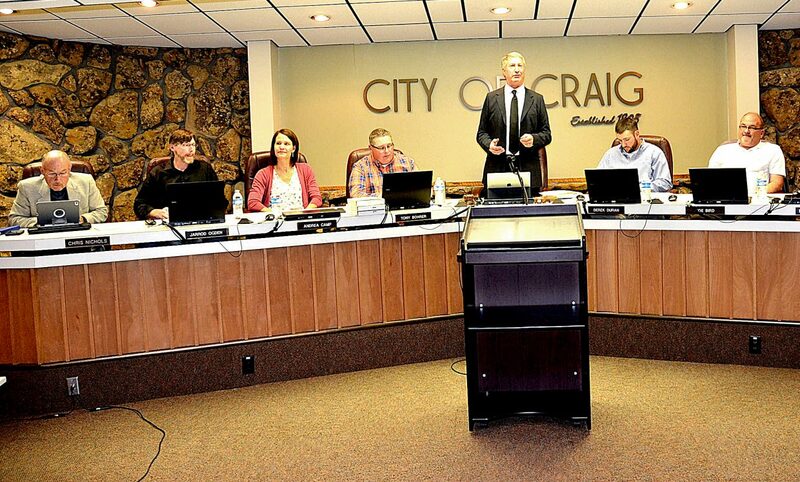 CRAIG — The Craig City Council is going back to the drawing board in its task of hiring a new city manger. During a meeting held Tuesday, June 26, Craig Mayor John Ponikvar said there were a few issues that had set members back. Prior to a planned introduction to the community, two of the four finalists dropped out, one for personal reasons and another to accept a job with a different community. As a result, the city has gone back to the recruiting agency with a time frame for hiring a new city manager, Ponikvar said. He added that, within a few weeks, he hopes the city can make public a list of candidates and dates for group interviews and community forums that will allow citizens to meet with potential new managers. Forty-six candidates originally applied for the city manager position, a number that was eventually narrowed to four. However with the to withdrawals, Ponikvar said he would like to have return the number of finalists to four, adding that the original final four candidates were very diverse and had good attributes. “We’ll bring in a very good cross-section of the community to interview and give recommendations back to council on who the next city manager should be,” Ponikvar said. The process usually takes three to six months, depending on the needs of the city, the mayor said. The city advertises the position for about a month, after which the recruiting company looks at their backgrounds and ensures they have the right qualifications. The council then further narrows the candidate pool with additional background checks. Council discussed the ongoing search during an executive session Tuesday, but no decisions were made. “It all takes time,” Ponikvar said. • Met with SGM representative Chad Paulson, who provided an update about engineering services on city projects, particularly an upgrade to the water plant, expected by 2020. The project is estimated to cost between $4 and $6 million, and city residents might see a rate increase of $5 to 25, though Ponikvar said he doesn’t expect increases to be that large. The engineering firm has considered the environmental impact and the city’s needs in terms of its projects. • Approved a one-year liquor license renewal for Mathers’ Bar. • Approved a conditional use permit for Tiny Tots Childcare to have up to 12 children in its care.